Ditch the paper towels and let our Kitchen Cloths and Towels help you effectively dry your cups, dishes and silverware; wipe and clean your sink and dirty countertops, and so much more. These extra-absorbent microfiber cloths and towels will help you grab, trap and eliminate kitchen messes using only water. Works great on all types of hard surfaces, including stainless steel, enamel, ceramic, glass, chrome, granite, marble, wood, tile and china. Contains our powerful BacLock®* antibacterial agent. Available in eleven on-trend colors: Latte, Teal, Sunflower, Eggplant, Blue, Pomegranate, Graphite, Charcoal, Sea Mist, Green and Navy. Cloth: 35 cm x 26 cm / 13.78" x 10.24" Towel: 65 cm x 35 cm / 25.59" x 13.78"
Abrasive cleaning solutions leave a film of broken-down dirt, grime and chemicals dried on your countertops once the water evaporates. Most towels and cloths just push the dirt around and become soggy quickly. 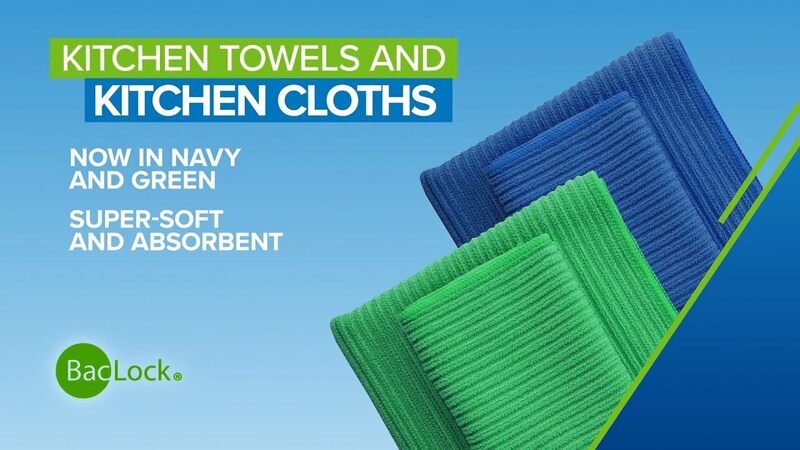 Norwex Microfiber Kitchen Cloths and Towels completely dry surfaces and thoroughly clean kitchen countertops with only water. Slightly dirty microfiber can be washed with Norwex Dishwashing Liquid under warm running water and used again before laundering. Cloths and towels that have been used heavily should be laundered using a Norwex laundry detergent, which contains no fillers, after each use. When using on easily scratched surfaces such as brushed stainless steel, first test Norwex Microfiber on an inconspicuous spot. Not for use on anti-glare surfaces. Norwex Microfiber uses a combination of static electricity and capillary action to pull dirt and grease up into the fibers and away from the surface. BacLock*, the micro silver agent in the cloth, goes to work with self-purification properties against mold, fungi and bacterial odor within 24 hours so that it is ready to use again. Less lint than traditional cotton cloths, so these towels and cloths help provide a friendlier environment for allergy-sensitive individuals. Many products incorporate silver because of its antibacterial properties. There are silver antibacterial socks, silver soap, silver-lined curtains in hospitals, silver-lined bandages for treating burns, even silver toothbrushes. *Contains BacLock, an antibacterial agent for self-cleansing purposes only. The agent is solely designed to inhibit odor from bacteria, mold and/or mildew growth within the product.